The action ramped up in Stage Five of the men’s KISS SUPER LEAGUE, with Richmond’s three punishing hills splintering the peloton. This week, riders raced on a replica of the UCI Road World Championships course in Richmond, Virginia. They rode two laps, each one starting flat and fast and ending in a series of 3 climbs that give little chance for recovery. The racers stuck together for most of the first lap, which featured a couple of intermediate sprints. Riders could win points in the sprint competition by being among the first across the line. New this week was a King of the Mountains (KOM) competition, which awarded points at the top of Libby Hill and 23rd Street. Lionel Vujasin (Zwift All Stars) clearly targeted both of these contests and fought for them hard. He crossed the line first in most of the sprints and KOM climbs. He used PowerUps frequently – a risk that could leave him without one at a crucial moment. The peloton hit the hills hard and fast on the first lap, stretching the group out as racers struggled to hang on. By the time the leaders climbed up Governor Street and started the second lap, their group only had 14 racers left. Madison Genesis had the advantage in numbers. They were the only team with four riders up front. 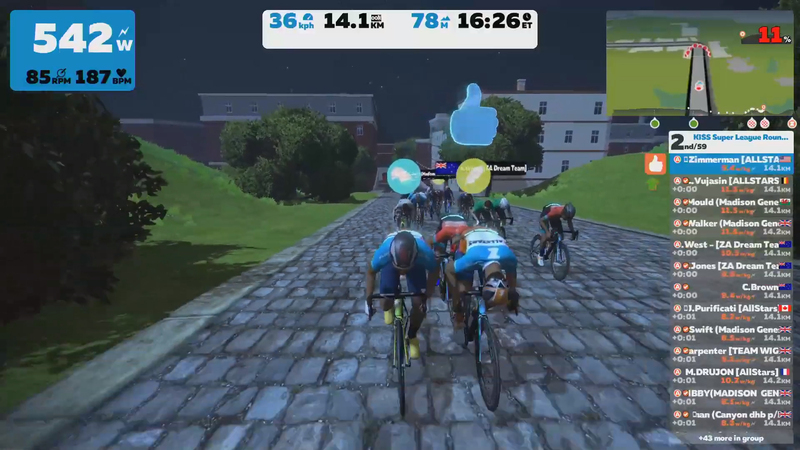 The Zwift All Stars had three, and the Zwift Academy Dream Team and Team Wiggins – Le Col each had two. After the intermediate sprints caused some surges, the gap to the chasers grew to about 40 seconds, and leaders began to ease up just a little. They knew a tough finale was ahead. But a couple of racers weren’t content to wait for the hills. Ben Healy (Madison Genesis) unexpectedly rocketed off the front with an aero PowerUp. Mathieu Drujon (Zwift All Stars) reacted quickly and bridged to him, and the pair gained 7 seconds as they rode along the James River. The bunch brought them back, though, just before the climbs began. The Libby Hill climb proved too much for Healy after his breakaway effort, and he dropped off the back. The leaders climbed the 23rd Street hill at a furious pace but got through it together. Vujasin led them over the top, with Jon Mould (Madison Genesis) close behind. The racers got a very short rest before reaching the second and last climb up Governor Street. 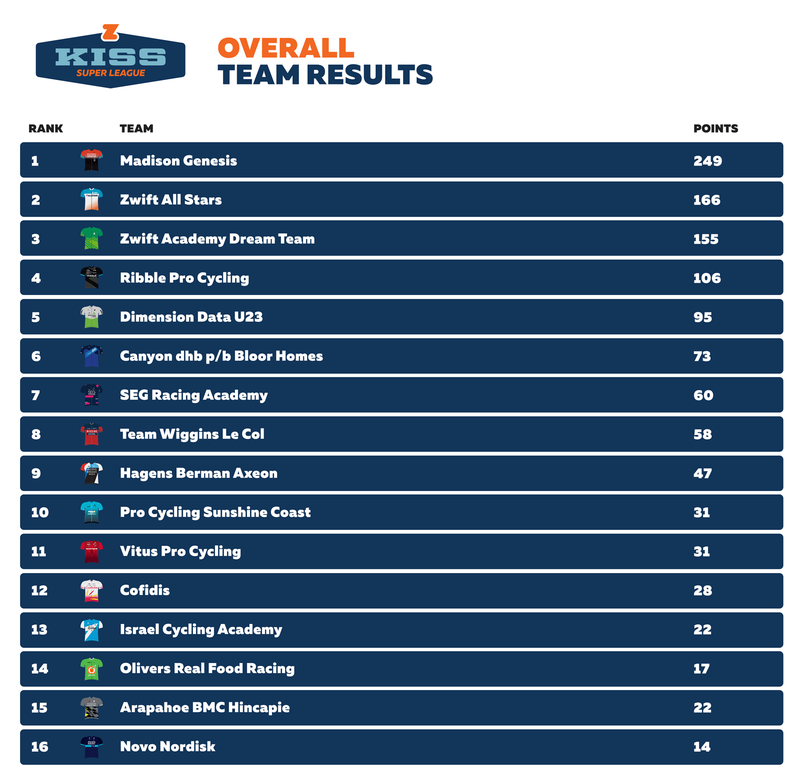 Madison Genesis and the Zwift Academy Dream Team both put on pressure, but the group stayed together. The race would be decided in a reduced bunch sprint. With 500 meters to go, Connor Brown (Dimension Data U23) went early, using an aero helmet PowerUp to get clear from the group. It looked like no one could hold his wheel! 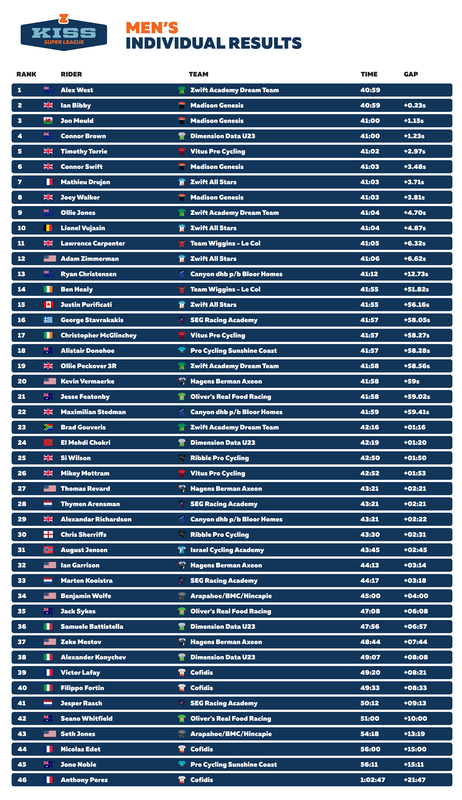 But Timothy Torrie (Vitus Pro Cycling) and Ian Bibby (Madison Genesis) were getting close. 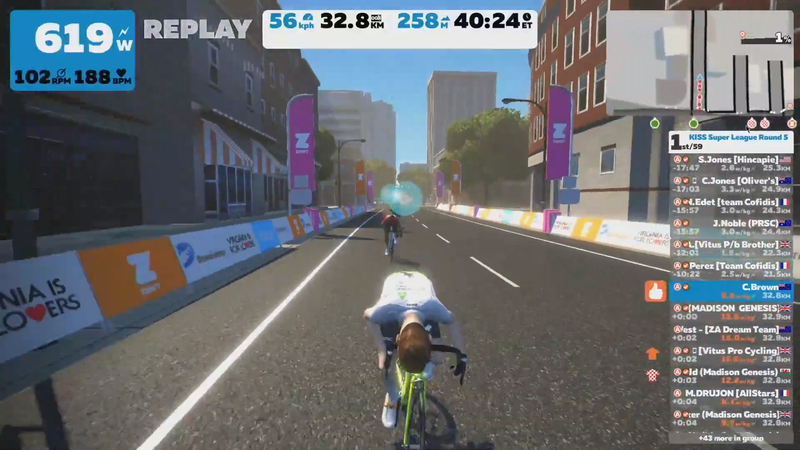 Suddenly, West shot around all of them with 100 meters to go, using his own aero helmet PowerUp for a speed boost. 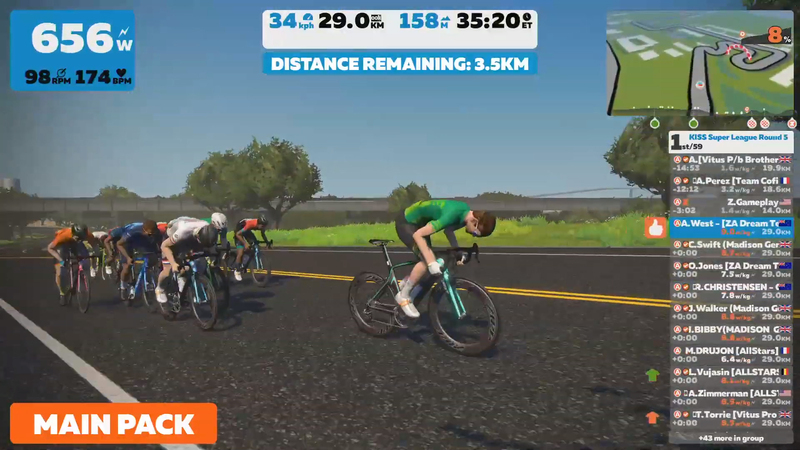 He sprinted across the line for his first win of the league – and the first win for the Zwift Academy Dream Team. Madison Genesis finished in second and third and kept all four of their riders in the front group. They’ve pulled even further ahead in the team standings as a result. When he saw other strong sprinters like Mould and Bibby reacting, he knew it was now or never. 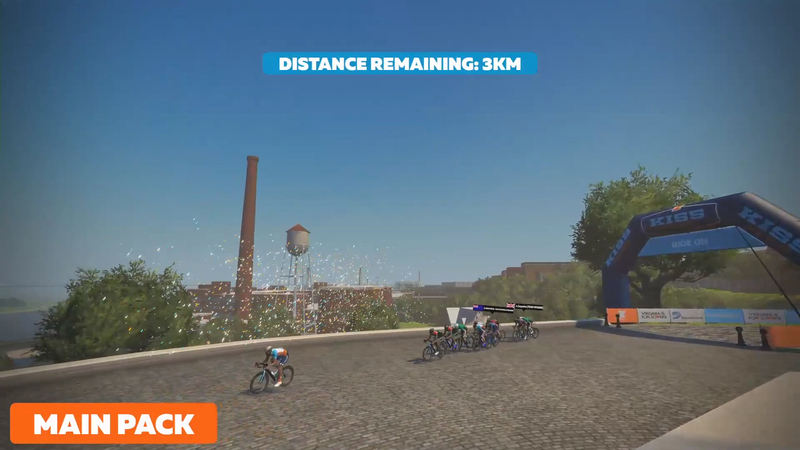 Can the Zwift community teams unseat Madison Genesis? Tune in live next Wednesday to see what happens next!